Finding the right wedding dress was the most difficult part of wedding planning for me. I went to more than 15 stores in the Greater Toronto Area (GTA) and tried on countless dresses. I was looking for a style that wasn’t trending at the time, and I was picky about the material. Although I was open to considering other designs, nothing felt right. I was very close to settling on just about any dress, until I met Evan Yanagi from Yanagi Group (Couture). She was beyond talented, insightful, honest while remaining kind, and just a joy to be around. She and her team created two custom wedding dresses and a perfectly matched (in colour) veil for me. They also made custom pocket squares for the groom, the father of the bride, and all of the gentleman in our wedding party. For the same price as a designer wedding dress, you could have a custom-made and unique dress that fits you perfectly and is exactly what you want. Yanagi Group also offers stunning and couture, custom-made Chinese dresses, off-the-rack wedding dresses, custom formal wear for men and women, and a casual clothing line, among other services. 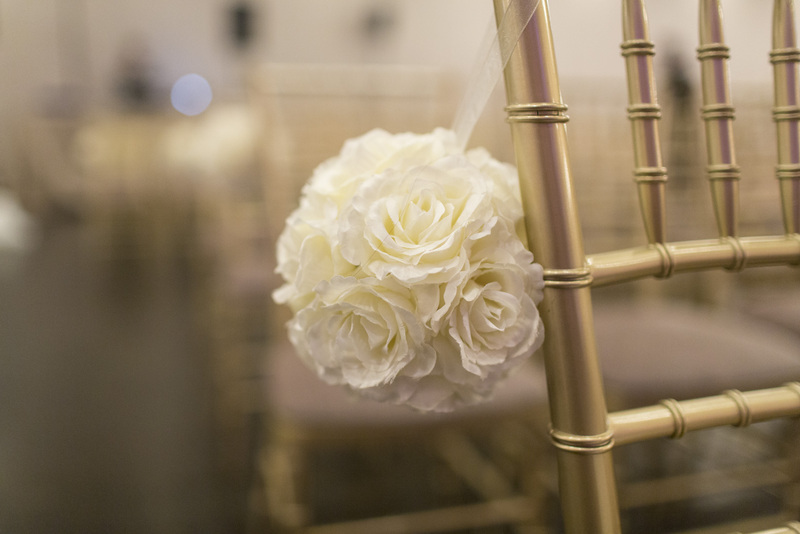 The colour scheme for our wedding was gold, blush pink, and ivory. I searched every day for almost two years for the perfect blush pink-coloured dress for my sister, our maid of honour. I exhausted the internet, malls, department stores, wedding dress shops, and boutiques. I even went cross border shopping. I was about to give up when, by chance, my sister happened to stumble into Anne Hung’s store on Queen Street West. There, we found the perfect blush pink fabric and stunning, affordable accessories. She has countless styles and colours for semi-custom made dresses. All of her fabrics are incredibly comfortable, too. My sister looked amazing on my wedding day with an Anne Hung floor length, blush pink dress and a stunning Anne Hung necklace that received many compliments. It was the most comfortable formal dress that she had ever worn. Furthermore, both my sister and I wore backless, strapless bras that we purchased from the Anne Hung store that day. The brand of bras that she carries in her store is the best that I’ve tried, and I’ve tried a few. The sales associate that we dealt with was wonderful, and Anne Hung was really lovely. She’s energetic, fun, and incredibly helpful. Our head table was a round table on the same level as our guests. We didn’t want to spend a lot of money on decor, but we wanted to rent a unique backdrop for the stage that would make a huge statement for the following reasons: we were getting married infront of it, we had our group photos taken infront of it, it was the backdrop to the speeches and most of the entertainment, and our guests could take photos infront of it instead of having a photo booth. Our custom designed, handmade paper flower wall turned out perfectly – it was impactful, unique, elegant, beautiful, and fun. 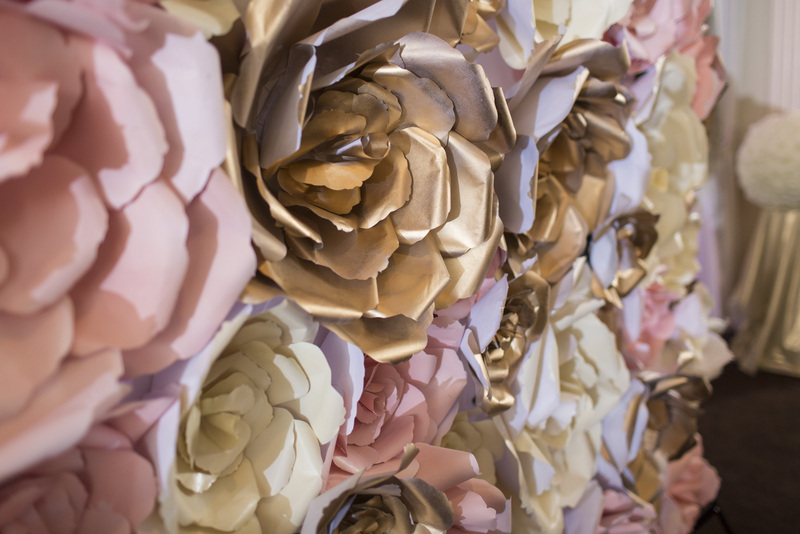 The backdrop consisted of giant paper roses in three different sizes and three different colours (gold, blush pink, and ivory). Our guests and our vendors (especially the photographers and videographer) loved it, too. Don’t judge Handmade Decor by their website. Be sure to request Zonny and Phuong. They are lovely, kind, and hard-working people that accommodated my particular requests and worked within my budget to make my vision a reality. We could not have asked for a better backdrop. Paperland – We had some table numbers printed here. We also purchased gold envelopes from them which we used for our wedding favours (lottery scratch tickets). The store can get quite busy, so don’t go if you’re in a hurry. The staff were extremely helpful, attentive to details, and we were able to get exactly what we wanted. They offer a wide range of printing services. Minted.com – This is an online company that prints invitations, cards, and other stationary. We found the best deal on gold foil pressed invitations from their website, so we used them for our wedding invitations. We were extremely happy with the price but slightly disappointed with the design restrictions. For example, we didn’t like the envelopes and we weren’t able to use blush pink paper for the invitations. They have tons of selection so I’m sure you’ll find something that you like. They shipped our order on time, things were well packaged, and they even included extra envelopes. 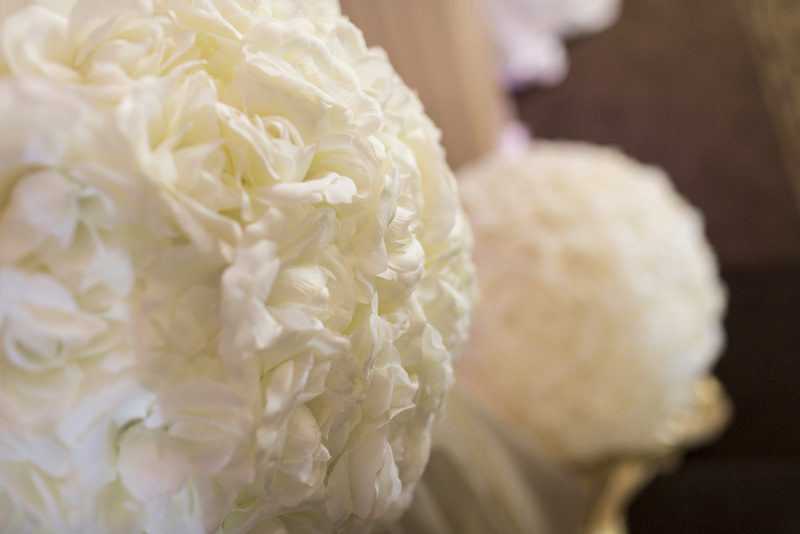 We were so happy when we found Right Choice Linen and Decor, because they had a wonderful selection for linen rentals at the most reasonable price that we found in the city. 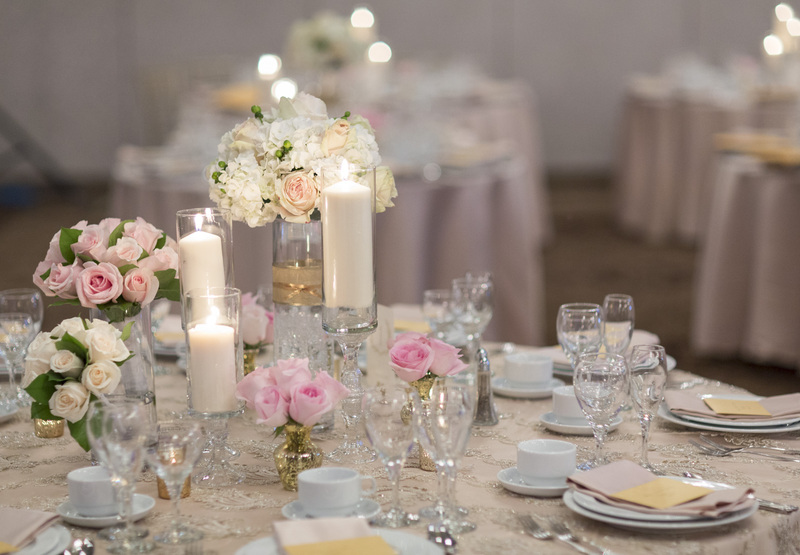 I was looking for elegant blush pink table cloths and napkins and their options were perfect. We also rented a gorgeous gold overlay for the head table. You can also rent backdrops and centerpieces from them. We wanted to have a bilingual (Cantonese and English) MC for our wedding so that our older relatives would be able to understand the events of the day. Joseph was the best MC that I’ve ever met and I met countless MCs when I worked in catering. He is professional, humble, trust-worthy, hard-working, pleasant, considerate, pro-active, and genuinely looking out for your best interest. On the day of, he went above and beyond and did things that I’ve never seen other MCs do. He worked well with all of our other vendors and he managed hiccups perfectly. We highly recommend him for any event. I was originally planning on making my own wedding cake, but luckily my family and friends talked me out of it. I am extremely picky about cake in general, and I am not a fan of wedding cake. While working in a banquet hall, I tried more wedding cakes than I can count and they were all dry and unpleasant. That’s why I am so grateful that I found CakeyBakey Boutique. We sampled cake from many popular Toronto bakeries and chose her with confidence and relief. Michelle uses high quality ingredients (some are imported from the UK), bakes traditional English cakes, and bakes from scratch. 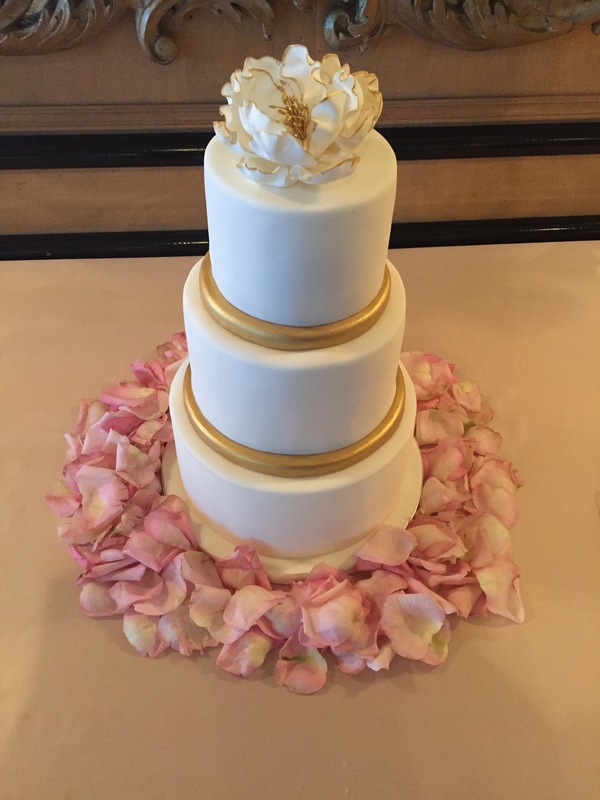 Our wedding cake was moist, flavourful, and delicious. Not only was it the best wedding cake that I’ve ever had, it might have been the best chocolate cake that I’ve ever had. Taste aside, she pulled off the difficult design that I requested. Above all, the prices were incredibly reasonable. Michelle was an absolute pleasure to work with. She is patient, sweet, flexible, and very hard working. We’ve already placed our order for our one year anniversary cake. When it comes to Asian skin tones and features, Shirley To is the best make-up artist in the city. She also does mens’ hair and make-up. She did John’s hair and make-up for our engagement shoot and he looked completely natural, only better. She’s also very sweet, upbeat, and fun to chat with. I read horror stories about unlicensed officiants performing ceremonies that weren’t legally binding, so we went with an officiant service. All Seasons Weddings was professional, pleasant, and responsive. It was a relief to know that the service would provide a different officiant in the case of an emergency. It also gave us a piece of mind to know that we could trust our officiant to have the proper papers and experience. We chose Brian Fairbrother from their long list of officiants and he was wonderful. He was easy to get along with, accommodating, and he made us feel comfortable and prepared. A few years ago, Hudson’s Bay got a complete overhaul. The store fronts were renovated, they brought in designer brands and high-end products, and the fashion styles received a much needed update. If you don’t believe me, check out their flagship store on Queen Street. I never used to shop at The Bay, and now it’s one of my top 3 favourite stores. I highly suggest you consider them for your gift registry. Signing up for their gift registry has additional perks, such as a free gift, registry events in store, and various discounts until 1 year after your wedding date. Be sure to sign up for their points card. If you qualify for their VIP points program, you’ll get even better sales and coupons all throughout the year. Although not all items can be added to your registry online or through their app (some have to be done in store), you’re sure to find what you need from The Bay. We’ve purchased furniture, skin care and cosmetics, towels, clothing and shoes, dishes, pots and pans, small kitchen appliances and tools, and Christmas decorations from The Bay. We couldn’t be happier with the selection and quality of the products, the frequent sales, and the service we’ve received. Kijiji isn’t a vendor, but I used it a lot during our planning process. Although browsing www.kijiji.ca is time consuming and dealing with sellers/buyers can be frustrating and disappointing, I had a lot of luck finding well-priced, gently used wedding items through the website. I also used it to sell some items after my wedding. Through Kijiji, I purchased most of the components for our centerpieces (vases, candle holders, wax candles, table numbers, table number holders), signs, and various sized pomanders.